A pair of nanobeams is held side-by-side and separated by a nanoscale gap, with one beam supporting a mechanical mode, and the other supporting a confined optical mode. The properties of the optical mode of the beam on the left are concentrated in the nanoscale gap in-between the beams, ensuring a strong radiation pressure interaction with the mechanical mode in the beam on the right. The platform enables nearly independent design of the optics and the mechanics. Researchers from the NIST Center for Nanoscale Science and Technology and Caltech have developed a new design platform for measuring and exploiting strong interactions between light confined in a nanoscale structure and an adjacent nanomechanical system. * The versatile platform opens new approaches for fabricating sensitive light detectors and for converting wavelengths for use in quantum information science. Previously, the Caltech team used silicon "optomechanical crystals" in which radiation pressure from light drove mechanical vibrations within a single, doubly-clamped silicon nanobeam. In the new work, the CNST-Caltech collaborators developed a design for observing similar effects in silicon nitride, which has a much broader optical transparency window than silicon, but for which radiation pressure interactions within a single nanobeam are expected to be much weaker. The new approach uses a pair of nanobeams held side-by-side and separated by a nanoscale gap, with one beam supporting a mechanical mode which has a specific vibration pattern and frequency, and the other supporting a confined optical mode which has a specific spatial field distribution and optical frequency. Crucially, while the properties of the optical mode are largely controlled by only one of the two beams, it is concentrated in the small region in-between the beams, ensuring that the radiation pressure interaction with the mechanical mode in the other beam is strong. Electromagnetic simulations show that the optomechanical interaction strength increased by nearly a factor of three relative to the single beam case. An important aspect of the new platform is that it enables near-independent design of the optics and the mechanics, so a wide range of new functionalities may be possible. In particular, the team is working on geometries in which two optical beams operating at widely different wavelengths are coupled to a mechanical beam held in-between them. Such devices are expected to enable wideband optical-to-optical and even microwave-to-optical frequency conversion, which would be significant advances in this field. 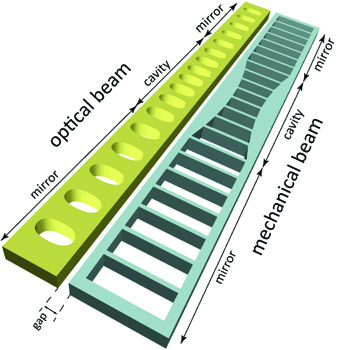 *Slot-mode-coupled optomechanical crystals, M. Davanço, J. Chan, A. H. Safavi-Naeini, O. Painter, and K. Srinivasan, Optics Express 20, 24394–24410 (2012).